Product Condition: The Everyday Full-Zip Hoodie - Men's is in Excellent condition. This item was previously owned for 2 weeks. The following observations were made concerning this item. All items sold as is, all warranties void. * Still has a new look, looks clean. May have been worn briefly, likely was tried on. * No longer has vendor tags, great item now at a super price. 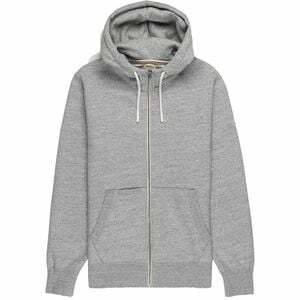 You kept your favorite hoodie for years, and made so many memories with it wrapped around you. There were the good ones, like camping underneath a blanket of stars, staring up as the Milkyway arced across the sky, and that time you hiked deep into the woods outside of Fernie, surrounded by the dank must of the pine floor, and bright glacial streams that rippled and bobbed around the trail. Then there were some hard times too, like when the-one-that-got-away broke your heart, when the cozy warmth of your hoodie was what you needed to comfort you through rough moments when your life felt like it was in shambles. You wore holes into the holes of that hoodie, until the sad day that you had to let your cotton comfort go. Reach for a new hoodie that is eager to be filled with memories, mundane or extraordinary, slide into the P.A.C. Everyday Full-Zip hoodie for the warm embrace you've been missing, and it will happily be there to keep you comfortable and warm as your continue your journey around the sun.